NOVACES is helping hospitals to become more efficient and reduce costs while improving patient care quality. While these two goals are seemingly at odds with each other – this can be achieved simultaneously. Some of the success stories that our clients have achieved are listed below. To read about how your hospital can achieve similar resutls, download the white paper "We, the Patient". The paper discusses how this process improvement methodology, when implemented properly, can drastically improve quality of care and financial performance simultaneously. 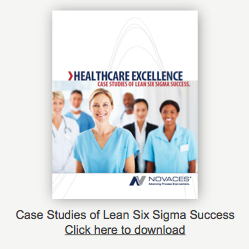 In addition, It includes a case study of how the cycle time for an inpatient billing process was reduced by over 50%. Outpatient Urology Procedures generated one-time savings of $765,000 and $180,000 ongoing annually. The project redefined the process to guarantee that all procedures performed were properly coded into the system for appropriate credit. Annual Occupational Health Screening produced annual savings of $504,000. This project looked at the reasons for missing the appropriate screening. The process steps were revised, standard work instructions updated and all appropriate personnel trained regularly on the new procedures. Maternal Child reduced patient cycle times through the OB clinic and improved support to physicians enabling the average number of patients per physician to increase from 14 to 17 per day. This captured 20% more OB specialty appointments per month for the medical center, significantly increasing revenues. Inventory Management for High Cost Immunizations produced cost avoidance of $180,000 and an annual savings of $41,980 by reducing database entry cycle time by 60%, optimizing just-in-time supply chain deliveries and capturing of out-dated immunizations using Reverse Distribution Contracts. Medical Claims Processing decreased the hospital’s average medical claims processing times by 344 days, and increased compliance by 99 percent. "Since we began implementing Lean Six Sigma with NOVACES, I've seen a positive cultural shift across our entire organization. The early investment we made in the JumpStart workshops with the leadership team was vital to our success. We are seeing performance improvements in both clinical and operational areas and are encouraged by the initial Lean Six Sigma successes." Cycle Time for Memorandums Of Understanding reduced the time to certify MOUs for specialty services, EMS and paramedic services and coordination with local universities, from 29 days to 14 days. New Employee Check-in Procedures was reduced from 2 weeks to 3 hours. For hospital contractors, check-in was reduced from as long as 2 weeks to 2 hours. Productivity was increased by more than 7,600 hours. Mammography Patient Care produced an annual cost savings of $37,093. Abnormal findings in mammograms often required contacting the patient at home and rescheduling for a repeat procedure. The process steps were revised for follow-up on abnormal mammograms, including contacting the patient while still in the clinic. As a result, patient satisfaction and patient safety improved while performing routine mammography screenings. NOVACES provided Kent Hospital’s leadership with deployment planning services and trained selected hospital staff to be experts in continuous improvement. Within just 3 months, the team achieved measurable results producing a return on investment of almost four times and counting. NOVACES has refined and tested process improvement methods over years of application by experts and business leaders to produce a process improvement roadmap called SystemCPI. Our healthcare team, composed of hospital executives and nurses, have dedicated their careers to developing innovative approaches to process improvement in such a dynamic working environment. Importantly, we made sure that this approach simplified management's job to implement the program and get the desired results. Click here to read the white paper about how SystemCPI can work for you.